I would personally like to thank you for taking the time to visit our website and hope you find the website user friendly and extremely helpful as you move forward with the purchase of your next vehicle, if you have any further questions feel free to contact me personally. 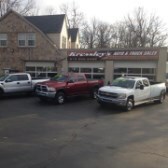 Thank you for your interest in Kressley's Auto and Truck Sales. If you have any further questions feel free to contact me to fully answer any of your questions, thanks for shopping Kressley,s Auto and Truck Sales. From the moment you step on our lot until the time you drive away in your next car, your buying experience with R.H. Kressley's Garage Inc. is our number one priority. We encourage you to use the expertise and resources of our sales staff; they are here to help you find the right car at the right price. Call us today at 610-395-2482 to schedule your test drive!